Above: when, why, and who, plus the allusion to where in werewolf, which is what gets us into interrogative words in the first place; that just leaves how and which. And the phonological issue: who are how are /h/-initial, but the rest are /(h)w/-initial, with some speakers having a voiceless initial often phonemically transcribed as /hw/, but most current speakers having a voiced initial /w/, so that for them whales and Wales are homophonous, as are which and witch, where and wear, why and (the letter) Y, and when and (the boil or swelling) wen. The were– of werewolf has /w/ for everybody, so that playing around with wherewolf would involve an imperfect pun (but that’s ok). 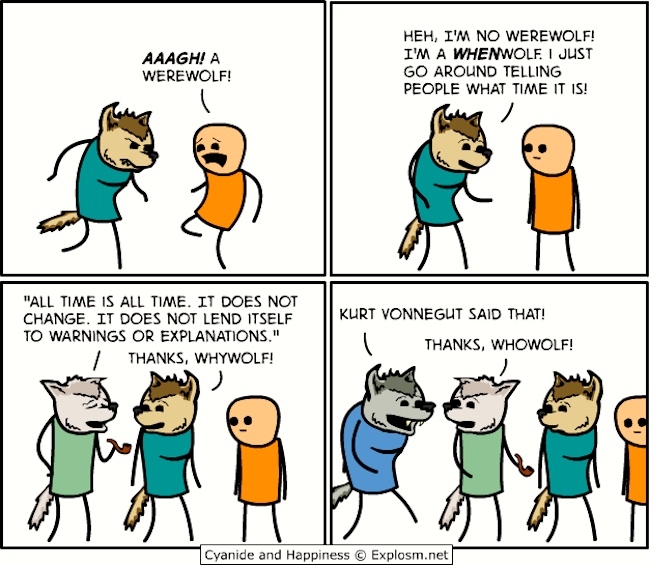 This entry was posted on March 3, 2019 at 12:47 pm and is filed under Books, Linguistics in the comics, Phonetics, Phonology, Puns, Quotations, Syntax, Variation. You can follow any responses to this entry through the RSS 2.0 feed. You can leave a response, or trackback from your own site. You probably know Christian Morgenstern’s poem about the werewolf, which revolves around the fact that wer ‘who’ has four cases in the singular, but has no plural. I’ve seen several attempts to translate it into English, none very successful.